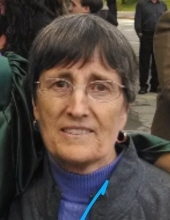 Maria (Goncalves) Cruz, 81 of Indian Orchard passed away peacefully on Tuesday, April 2, 2019. Born in Tras os Montes, Portugal to the late Domingos and Albina (Afonso) Goncalves, she has lived in Indian Orchard for many years and was a faithful parishioner of Our Lady of Fatima Church. Maria enjoyed gardening, sewing, crocheting, her rabbits and her puppy, Patches. Maria was the beloved wife of the late Fernando da Cruz who sadly predeceased her in 2010. She leaves her loving children; Anabela Cruz and her boyfriend Walter Rose of Belchertown and Jose Cruz and his wife Lauren of North Grafton, Ma; cherished grandsons Dustin and Maxwell; dear nephews Fernando Goncalves and wife Clementina, Paul Martins and wife Vera and niece Cristina Martins as well as many nieces, nephews and extended family and friends. Maria also leaves her 2 brothers in Portugal and France and was predeceased by her 5 brothers and sisters. Funeral services will be held on Saturday April 6, 2019 at 8:00am from the Ludlow Funeral Home with a Liturgy of Christian Burial celebrated at 9:00am in Our Lady of Fatima Church followed by burial in Island Pond Cemetery. Visiting hours are Friday evening from 5:00-7:00pm. To send flowers or a remembrance gift to the family of Maria (Goncalves) Cruz, please visit our Tribute Store. "Email Address" would like to share the life celebration of Maria (Goncalves) Cruz. Click on the "link" to go to share a favorite memory or leave a condolence message for the family.